How can I find the Hotels & Prices? After you have selected the Resort of your preference, do select the dates that interest you and click ‘search’. Following, without delay, the prices of available rooms & hotels will be displayed. All prices appear on the website are final, per room per staying and include all VAT & Taxes. How do i know the Board Type? AI = All Inclusive FB = Full Board HB = Half Board Β.Β = Bed & Breakfast SC = Self Catering RO = Room only. Bookable through live Chat Hotels and the rest of the Hotels? Smart Deal Hotels are the Hotels that you pay only 10% of the total cost per reservation at the time of booking, while the remaining balance is paybale at the Hotel Desk during your staying. Bookablabe through Live Chat Hotels are the hotels that you can only book via the Live Chat Assistance, Call Center or Email. The rest of the Hotels that you see on our website(more than 3,000 Hotels Worldwide) are bookable online, in real time with instant confirmation. By making the booking via escapeurope.com will my credit card be charged? Yes. All bookings are due for full payment at the time of booking unless your arrival date is more than 90 days from the booking date. In this case, 20% of the total cost is required. The rest of 80% will be charged 56 days before Check in Date. In case you pay by credit or debit card, we shall automatically process the payment at the time of booking or few hours after in accordance with the above terms. An extra 3% fee applies if you pay by Visa Electron, Visa Credit Card or Master Card charged by the Bank to us for the transaction. You hereby give us your consent for the above procedure. Failure of payment due to unauthorized or improper use of the credit card or any other reason shall result in your booking being cancelled. 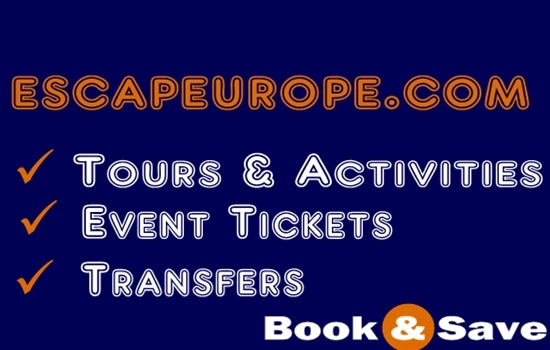 Your reservation is confirmed at the time you get the confirmation Email, send to you by escapeurope.com and before we have checked the validity of your Credit/ Debit Card. Other services provided by our website, such as car rentals, transfers and flights are a matter of different terms and conditions and credit card will be charged. How do I change or cancel the reservation? For Smart Deal Hotels, visit the home page, in the upper right site, click on the "Reservation Status". Enter your reservation code and fill in the necessary fields. For all other hotels please send us an email at with the booking name, Hotel Name, Check in/out Dates and we will reply to you as soon as possible with a maximum of 24 Hours. How do we make the reservation and in which way that protect the privacy of our customers? Your personal information are been sending to us via a secure server. We use the most advanced technology to protect your privacy and under no circumstances delegate the information entrusted to us. Your credit card information is coded using the ‘Secure Socket Layer (SSL) method. Can I book via phone without using my card on-line? Yes. Contact customer service of escapeurope.com. Make sure you have chosen correctly the dates and the accommodation. Yet, a valid credit card is needed to confirm your booking and a valid e-mail address in order to be sent the confirmation of your reservation. In case of amendments, cancellation, late cancellation or no check in, will i be charged? If you wish to make changes to a confirmed booking we will try to accommodate any such requests but since there may not be availability on the date required we cannot guarantee to do so. If the requested amendment can be made, a fixed fee of €20 per booking will apply unless alternative arrangements have been made by way of a separate agreement with us. This fixed fee will be increased by any costs that may be charged by the provider of the accommodation to us when the original booking is cancelled. Please note that if the required amendment involves a change of hotel, the amendment will be considered to be a cancellation of the original booking and appropriate charges will apply. Cancellation charges will vary dependent upon the date of cancellation i.e. the sooner you cancel, the lower the cancellation fees. Note: For early booking discounts and for bookings during periods of trade fairs, exhibitions and other special events, different cancellation terms will apply. We suggest you call us for the cancellation policy of the hotel you require at the time the booking is made. If your booking is for more than one person and one or more members of the party cancels, the remaining members of the party may find that the cost of their accommodation changes to reflect the consequent under-occupation of the accommodation booked. We will endeavour at all times to ensure that hotels make no changes to bookings that we have made with them. If, however, we are advised by the hotel that they have to change your booking or they are unable to provide the accommodation booked we will inform you as soon as possible before departure if we are able to do so. Under those circumstances we will endeavour to provide you with similar accommodation but if you do not choose to accept that accommodation you can cancel with a full refund. Please note, however, that we will have no other liability towards you in respect of any other services booked with third parties that may be affected by the accommodation change. If, for whatever reason, we cannot contact you before departure or if a hotel (or supplier) is forced to transfer the guest and his or her party to alternative accommodation upon their arrival in resort, they will undertake to transfer the guest and his or her party to alternative accommodation of equivalent rating to that originally booked and when that undertaking has been fulfilled neither they nor we will have any other liability towards you. Please note that if for any reason (for example a significant flight delay of two hours or more) the guest’s arrival date or time changes, it is vital that the hotel be notified immediately. Otherwise the guest and his or her party may be considered to be a no show and their accommodation may be released. Please also note that no refund can be claimed if the guest and his or her party stay at the accommodation for a shorter period than that for which you have booked. If the hotel management has reason to believe that the guest or any member of his or her party has caused damage to hotel property and/or has behaved in a way that has caused or is likely to cause danger and/or distress to other guests and/or hotel staff, they reserve the right to terminate the guest and his or her party’s stay immediately and we will in those circumstances be under no further contractual obligation to you and/or the guest and his and her party. Full cancellation charges will then apply and neither the hotel nor youtravel will have any further responsibility for or liability towards you and/or the guest or his and her party. Furthermore, if the guest or any member of his or her party causes damage to the hotel or to any other third party during their stay, you and/or the guest and his or her party will be liable for the cost of repairing any said damage and you and/or the guest and his or her party will be liable for any subsequent claim made against us or the local agents or the hotel by the relevant party. The guest and his or her party will in all instances be liable for all and any expenses incurred during their stay and these must be paid in full before they leave the hotel. In instances whereby bookings are made directly with us by a member of the public, we will communicate only with the party leader (“the guest”) who will be deemed to take responsibility for all members of his or her party and who will be expected to communicate to the remaining members of his or her party any information supplied regarding the booking. We will act at all times upon the assumption that the guest has obtained agreement from all party members to the original booking and to any subsequent changes of any nature that maybe made to the booking. In instances whereby bookings are made by a company and not the guest we will communicate with the company. All communication and confirmations between the parties will be effected through emails. Any special requests must be made directly to the hotel and we offer no guarantee that those special requests will be met. We do not give any undertaking as to whether a hotel will be able to cater for those who require special diets nor do we give any undertaking as to the suitability of properties for disabled clients. If any member of a party requires a special diet or suffers from a disability, appropriate checks should be made before booking to establish that the property chosen is suitable. We accept no liability for complaints relating to accommodation arrangements apart from cases where damage to you has been caused due to our negligence. We assume no liability for any products or services that may be supplied by our partners nor for any other services (eg flights or transfers) booked with third parties. Our liability is in respect of the provision of the accommodation only. If the guest or any member of his or her party have any complaints during their stay at the hotel, they must try to resolve them immediately by reporting them to the hotel staff. If the problems are not resolved, they should contact the local agents whose details are given on our voucher. If the problems remain unresolved, they should call the company through whom the booking was made so that action can be taken. If the guest and his or her party remain dissatisfied after the holiday ends they should write to the company through whom the booking was made within 28 days of their return to the place of departure.